My colleague Pushkar Bhatnagar of Indian Revenue Service is the real originator of this theory. He acquired a software named Planetarium, used to predict planetary movements and configurations. By entering in this software, precise details of planetary positions vis-à-vis zodiac constellations described by Maharishi Valmiki in the Valmiki Ramayan, it is possible to determine important dates starting from Shri Ram's birth-date to the date of his return to Ayodhya. More than just Ram's date of birth... The results have not just thrown up Shri Ram's date of birth; it has actually traced the entire sequence of incidents throughout Ramayan. Pushkar Bhatnagar starts with tracing Ram's birth. Then he moves ahead in the narrative. Valmiki Ramayan states Ram was 25-years-old when he went to exile. When the configuration of planets described at this point is fed into the software, the date thrown up matches perfectly with Ram's age at that juncture of his life - 25 years. Again in the 13th year of Ram's exile, during a war with Khar and Dushan, Valmiki describes a solar eclipse. The software proves that on that given day there was indeed a solar eclipse (with Mars in the middle). This solar eclipse and the particular configuration of planets could be seen from Panchavati (longitude and latitude plainly shown in the software). Hanuman Saw 8 Constellations while flying to Lanka... In the Sunderkand, when Valmiki describes Hanuman crossing the sea and returning from Lanka to Rameshwaram, he gives details of 8 constellations. Usually, one can see not more than 6 constellations at a given point of time. But since Hanuman was flying across, and it must have taken him approximately 4 hrs to get there, he could see 8 constellations - in two hours one constellation would have moved out of sight and another become visible. So, in a period of 4 hrs he saw 8 constellations! 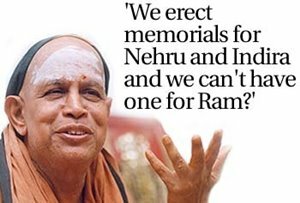 Historicising Shri Ram. Man or God... After researching on Shri Ram, I do believe he's a man who walked the earth in flesh and blood. There is an essential difference between the Valmiki Ramayana and the Tulsi Ramayana. Tulsidas was a devotee who looked up to Ram, but Valmiki was a contemporary. Valmiki has written Ram's life-history, as a biographer does - he's a contemporary of Ram, and this is not very different from what happens all over the world. Kings have always had their life-history written. The submerged bridge... Recently, NASA had put pictures on the Internet of a man-made bridge, the ruins of which are submerged in Palk Strait between Rameshwaram and Sri Lanka. This clearly should be treated as historical evidence that corroborates its mention in Valmiki Ramayana. Without the aid of science it is practically impossible to manually calculate the exact planetary configuration 7, 000 years back. It is science which is going to validate our history and prove that it is much older than 3, 500 years. “I seriously feel that there can only be positive effects of my research. In fact, Indians should seriously re-look how old is our history and culture. This is not the end of the research; it's just the beginning. People should be encouraged to do more in-depth research by all means such as archaeology, dating methods and oceanography. Max Mueller had come up with the theory that Aryans had come to India in 1500 B.C. In the Internet, Max Mueller Foundations says that that they have re-looked at this theory and is of the opinion that this theory is no longer valid because Indian history is much older than that period. It's just that people have to open up their minds and find out the answers for themselves”. According to this research Lord Ram was born on the noon of January10 in the year 5114 BC. In Hindu calendar, it was the ninth day of Shukla Paksha in Chaitra month. Stunned! Well, this exact date of the birthday of Lord Rama is found in the book ‘Dating the Era of Lord Ram’ by Shri Pushkar Bhatnagar. The exact date was obtained by entering the planetary configuration at the time of the birth of Lord Ram as mentioned in the Valmiki Ramayana in Planetarium Software. Interestingly, for thousands of years Hindus have been celebrating Ram Navmi, the birthday of Lord Ram, exactly on the same time and date. In the original Sanskrit Ramayana written by Sage Valmiki, while mentioning about the birth of Lord Ram, Valmiki had mentioned the astronomical details of the precise moment. Valmiki himself was present in the palace of Dasaratha and he mentions it thus in Bala Kanda of Ramayana. On completion of the ritual six seasons have passed by and then in the twelfth month, on the ninth day of chaitra month when the presiding deity of ruling star of the day is Aditi, where the ruling star of day is punarvasu, the asterism is in the ascendant, and when five of the nine planets viz., Sun, Mars, Jupiter, Saturn, and Venus are at their highest position, when Jupiter with Moon is ascendant in Cancer, and when day is advancing, then Queen Kausalya gave birth to a son with all the divine attributes like lotus-red eyes, lengthy arms, roseate lips, voice like drumbeat, and who took birth to delight the Ikshwaku dynasty, who is adored by all the worlds, and who is the greatly blessed epitome of Vishnu, namely Rama. [1-18-8, 9, 10, 11] When this data was entered in the Planetarium software, the day was January 10, 5114 BC. But how could Chaitra Shukla Navami occur in January? We celebrate Ram Navami in March or April. The answer to this was found in an article in Organizer. There is an astronomical phenomenon called ‘precision’ of the sun as also of the equinoxes. According to the latter, the star which is now taken to be the Pole Star (Dhruv Tara), would yield the place to the Star Abhijit (Vega, alpha Lyrae), 14,000 years from now. So when the lunar month of Chaitra occurred seven thousand years ago in the month of January, 7000 years later, it occurs in the month of (generally) April. Further, Valmiki had mentioned about other planetary configuration. One such was the planetary configuration when King Dashratha decided to make Lord Ram the king of Ayodhya. According to the book, such a planetary configuration was prevailing on January 5, 5089 BC. 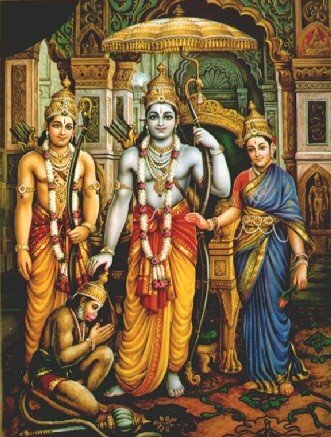 Lord Ram was then 25 years old and there are indications in the Ramayana that Lord Ram left Ayodhya when he was 25. The solar eclipse mentioned in the Ramayana work out precisely to the Ramayana period. From an article written in 2003 in the Tribune by Saroj Bala on the book ‘Dating the Era of Lord Ram’ Valmiki Ramayana refers to the solar eclipse at the time of war with Khardushan in latter half of 13th year of Shri Ram’s living in forests. Valmiki has also mentioned that it was Amavasya that day and planet Mars was in the middle. When this data was entered, the computer software indicated that there was a solar eclipse on October 7, 5077 BC (Amavasya day) which could be seen from Panchvati. On that date, the planetary configuration was the same as has been described by Valmiki i.e. Mars was in the middle, on one side were Venus and Mercury and on the other side were Sun and Saturn. On the basis of planetary configurations described in various other chapters, the date on which Ravana was killed works out to December 4, 5076 BC. Shri Ram completed 14 years of exile on January 2, 5075 BC. That day was also Navami of Shukla Paksha in Chaitra month. Thus, Shri Ram had come back to Ayodhya when he was 39 years old (5114-5075). To understand the book ‘Dating the Era of Lord Ram’ one needs to have some elementary knowledge of astronomy. When we try to prove the birth of Hindu icons, it must be understood that these Hindu icons rarely bothered about birth and death. Through Sanatana Dharma they teach us to rise above birth and death. It believes that life is a continuity.